Hey, guys. Claude Johnson from guitarcontrol.com. of your own licks. So here’s the lick. some position shifts to create different licks. 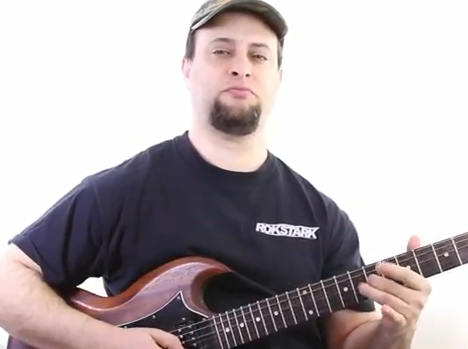 There are different ways to create interesting licks. box for starters and create cool licks. the root position and the root position itself. then the next string 3-5 and then 2-5, 2-5, 3-5, 3-5.
that this note, the D, is the same as this D.
is the 5th fret of the B string. Back, another triplet. can end it off with just three notes going down. this, with a double. Kind of an Eric Clapton lick. But the important point is that you’re shifting. for now, folks. Have fun and I’ll catch you next time. Thanks Claude. I need faster fingers? Thanks! Moving from on box to another really adds depth to my riffs. As Bob says “Baby Steps”. Love it, it looks so relaxed and flowing. 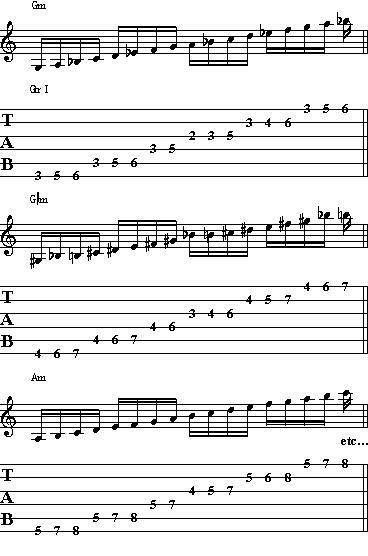 There are loads of licks that could be played using this method. I always seem to pick up the most difficult way of playing them instead of using my head and hands to find an easier way. Thank you. You shifted from a G pentatonic to an A pentatonic and later to a B pentatonic.? There is a nice idea there, in repeating as you travel the fretboard. Hey Claude, wouldn’t it be Am Pent? C being the b3? You’re right. It is the minor pent he’s using. If you want the major just shift the “boxes” down three frets. Just go back to the pentatonic boxes and you’ll see that there are no shifts in the scale – this let’s you play all over the fretboard. When you want to do a lead that’s more country (a Grateful dead lead for example) play all the pentatonic boxes but 4 frets lower! Take a song like “Friend of the Devil” in G and play over it as if you’re playing the blues in E – that gives you a whole new genre for the pentatonic boxes!! I like that you show every finger placement and move, and the notation and the tab. All bases are covered 100%. That’s something that I can follow. Thanks! Claude, all that is so cool but, I am not able to pick the strings with the pick or my fingers in time with with my left hand. What can I do to know what strings to pick with what note? Thanks Claude, I need more Pentatonic Licks With Position Shifting,Once Again Thanks so lot. Got any tips for someone learning on a seven string? The picking technique was unmentioned, but also really nice. Very efficient picking. Thanks, Claude for taking the mystery out of some of the licks I see others do but so fast I can’t see what they’re doing. Gibson learn and master. It has took me along ways as to how much I have learned. people liked me and others. I hope to order you blues course very soon, for it well get me on my way to playing better leads and songs. Thanks bro, I am finally getting into lead guitar after always playing rhythm. And you make it easy. Actually I’m liking lead more than rhythm.!!!!!! Your lessons make it very easy to understand and apply!!!! Your step by step of the ascending and descending scales are very easy to apply !!!! Thanks for taking the time to show people your techniques thumbs up to you and horns. Keep on keep n on.People like you let people like us get and develope a strive to keep on practicing for perfection. ROCK ON BRO.!!!!!!!!!!! Thanks Claude really useful stuff. I’ll have a go at that. I havent received my guitar yet but i enjoy watching and learning.. Looking forward to getting my guitar in a couple of days and getting started. How do you get that tone? It can’t just be gain, can it? Thanks Claude, your lessons/instructions have been a huge help to me! this is sweet.the lick and the fact that i learn something new on my guitar everyday .daily free lesson just by opening my email.thanks claude. when i get some extra cash i will purchase your other stuff. this lesson is very interesting and amazing. Few notes but extremely powered. The result is fantastic. I follow your lessons with interest. Some times I have problems because you talk very fast and I cannot follow the meaning of your speech. I am from Italy. Thanks a lot. Keeping in touch. WOW— faster fingers–and how would all of this sound without the EFFECTS? just on an accoustic? YEAH MIKE, THERE ARE 5 BASIC (A minor PENTATONIC )PATTERNS. YOU KNOW THE ONE ON THE 5TH FRET. NOW LEARN THE PATTERN ON THE 3RD FRET, AS SHOWN BY CLAUDE, THEN ANOTHER EASY A minor pentatonic PATTERN STARTS AT THE 10TH FRET (D). THE E A &D strings all go 1-3 , 1-3, 1-3 , OR (D-E ,G-A , C-D.) THESE PATTERNS ARE ALSO C MAJOR PENTATONIC SCALES , AS C MAJOR AND A MINOR ARE BLOOD BROTHER CHORDS. GO MIKE ! THANKS CLAUDE. Claude don’t know why, but for the past few weeks, I can’tlay your videos.click on the dart, but nothing. Hey Claude ur awsome,thnx for the guitar lessons!!! What kind of amp are you using? How do you have it set? That tone is awesome…. I discovered your weblog internet site on google and check some of your early posts. Continue to maintain up the really great operate. I just extra up your RSS feed to my MSN News Reader. Looking for forward to reading even more from you later on!